What started as an idea three years ago morphed into a TCC and CPS partnership where high school students can earn their Career Studies Certificate in Mechatronics and an industry-recognized credential along with their diplomas. Manufacturing finally has its own week in the City of Chesapeake in large part thanks to a partnership with Tidewater Community College, Chesapeake Public Schools (CPS), Chesapeake’s Department of Economic Development and its local manufacturing sector. 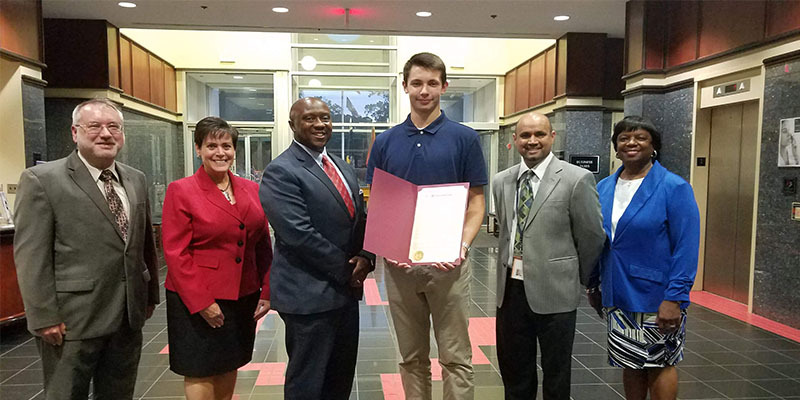 Earlier this week, Chesapeake City Council designated the second week in October “Manufacturing Week in Chesapeake” to celebrate a successful partnership that fills the skills gap for industry and provides quality career training for dozens of students. This designated week follows the celebration of National Manufacturing Day which is held annually on the first Friday of October. 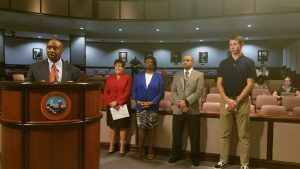 Chesapeake City Council designated the second week in October “Manufacturing Week in Chesapeake” to celebrate a successful partnership that fills the skills gap for industry and provides quality career training for dozens of students. “Manufacturing in Chesapeake is having a greater impact on our local economy with more spin-off jobs than any other industry,” said Steven Wright, director of Economic Development for the city. Chesapeake is home to more than 40 manufacturing firms, employing more than 3,200 skilled technicians. After graduation, students may complete their Associate of Applied Science in Mechatronics in just one year. Western Branch’s Alex Kincaid is a junior in the program. The program is supported by local manufacturing businesses and includes plant tours and mentoring for students. The program is supported by scholarships from area manufacturers, bringing in $29,000 to help students pay for college courses while still in high school. Participating organizations are Air Systems International, GeoQuip Manufacturing, Manufacturing and Design Tech, Mitsubishi Chemical Composites America Inc., Towne Bank, Nitto Inc., Sumitomo Drive Technologies, USUI International, and Yupo Corporation.